Make this Slow Cooker Lemony Turkey Soup with Spinach and Orzo with leftover turkey, or make the soup with chicken if you don’t have any turkey. This tasty soup is low-glycemic, South Beach Diet friendly, and dairy-free. 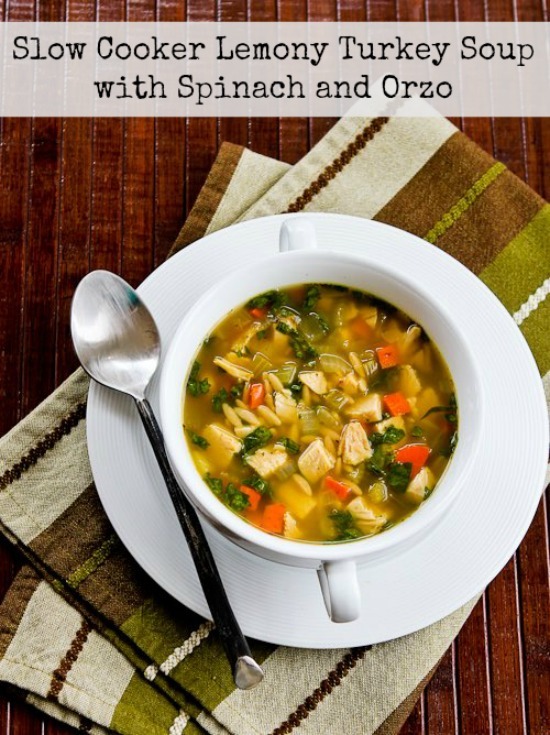 Click to PIN Slow Cooker Lemony Turkey Soup with Spinach and Orzo! I realize plenty of people haven’t even started yet looking for Thanksgiving recipes (and here are my Top Ten Favorite Thanksgiving Recipes if you need ideas.) But in the crazy world of food blogging, if I want people to find my ideas for leftover turkey, I need to post them well before Thanksgiving so search engines will index them and they’ll get shared on Pinterest. And truthfully, this Slow Cooker Lemony Turkey Soup with Spinach and Orzo was so delicious I couldn’t wait to share it. I gave some of the soup to my sister Pam, and everyone at her house pronounced it to be a keeper; in fact Pam asked when the recipe would be on the blog. Of course, if you’re not going to be having any leftover turkey, you can certainly make this with chicken instead. This is a soup where you simmer the stock, vegetables, and dried herbs in the slow cooker for quite a while and then add the orzo, diced cooked turkey (or chicken), and spinach at the end. The long simmering builds flavor, and you can simmer the soup all day while you’re at work if you need that type of recipe, or do it for a shorter time on high, which is what I did. Adding the cooked turkey towards the end of the cooking time eliminates that problem where the turkey meat shreds apart, and I thought this was a fresher take on the traditional turkey soups you see this time of year. Someone scolded me on Pinterest for using this product (and here are the ingredients if you want to check it out), but I like to add about one tablespoon of Penzeys Turkey Soup Base for extra flavor. (The soup base is on the salty side, so use homemade stock without lots of salt or low sodium canned chicken stock stock if you’re using this.) No “food police” comments please; just leave this out if you don’t want to use it. After the soup has simmered for 4 hours on high or 8-9 hours on low, it’s time to add the orzo. I use my favorite whole wheat orzo, which is great for soup. You might be tempted to add more orzo than 1/2 cup, but it expands quite a bit. If you want less carbs in the soup, 1/4 cup orzo will also be fine. Add the orzo to the slow cooker; then chop 3-4 cups of diced turkey and add that. If you’ve been cooking on low turn the slow cooker to high and cook about 30 minutes, or until the orzo is soft with still a tiny bit of bite. Then chop up a couple of handfuls of spinach leaves (next time I might use a little more.) Add the spinach to the slow cooker and cook until it’s no longer all floating on top (about 15-20 minutes.) Stir in the lemon juice, cook 5 minutes more, and serve. Make this Slow Cooker Lemony Turkey Soup with Spinach and Orzo with leftover turkey, or make the soup with chicken if you don’t have any turkey. Put the homemade turkey stock or homemade chicken stock in the slow cooker and turn it on to heat while you chop the onion, celery, and carrots. Cook on High for 4 hours or on LOW for 8-9 hours. Chop the leftover turkey into pieces slightly larger than the vegetables, and add to the soup. Cook about 30 minutes, or until the orzo is soft with still a slight bite to it. While the orzo and turkey simmers in the soup, pull stems off the spinach leaves (optional, but I don’t like having a bite of stem in my soup), wash spinach in salad spinner, and coarsely chop the spinach. Stir in the lemon juice and cook 5 minutes more. I’m guessing this freezes just fine, but we didn’t have any leftovers to try it. I used a Crock-Pot 5-Quart Smart-Pot Slow Cooker, but a slightly smaller size will work. This Slow Cooker Lemony Turkey Soup with Spinach and Orzo is loaded with healthful low-glycemic ingredients, and would be suitable for Phase 2 or 3 of the South Beach Diet. If you want a lower-carb soup, use less orzo, or replace the orzo with cauliflower rice for a soup that’s even lower in carbs. Oh no I switched the times; thanks for catching. Should say 4 hours on high or 8-9 hours on low. I will fix as soon as I get home. Did you mean 4 hours on high or 8-9 on low? vphappy, so glad you like it. I just made it again last night for my brother and a friend who came over for dinner and it was a bit hit! Love this recipe. It has such wonderful flavor and yet it's so healthy. Hi Becca. We loved this soup (Pam and her family ate most of it!) If you don't like sage I'd use double the amount of thyme. Should still be good. Cozy in Texas, I think you can use brown rice, white rice, barley, or other small pasta shapes. Brown rice or barley will take longer to cook. This looks great. Can you add something other than Orzo do you think? Yummy! Not a huge fan of poultry seasoning. I don't like the sage (I think) should I sub it for anything or do you think it'd be just fine without it? Thanks Amanda. It was a big hit here, loved it! I am totally adoring this recipe! !